On September 15th, Cassini’s 20-year-long exploration of the Saturnian system will finally—regrettably—come to an end. But even in its final act, the spacecraft has been sending back some of the most detailed images it’s ever taken. In one of its recent dives into the gap between Saturn and its rings, the spacecraft took a sequence of photos that offer an striking and unusual view of Saturn’s main rings—and now it’s a mini-movie. According to NASA, Cassini took 21 photos within a span of just four minutes on August 20th. Due to the vantage point of the wide-angle camera, it’s a bit tough to make out each of the big rings, but the most dedicated among us can see the ghostly C ring and brilliant B ring. An especially astute viewer will also notice the Cassini Division, or the 3,000 mile (4,800 km) gap between Saturn’s A and B rings. Do you agree with this assessment, Robert? “…a second landfall is not the emergency it sounds like, despite news headlines that indicate otherwise. “That is not the headline I would write,” said Jack Beven, a forecaster at the National Hurricane Center. Beven is in charge of Harvey on Monday. Where the center of the storm makes landfall is important, because the storm surge and tidal effects are the worst to the right (in this case, the northeast) of the center. If landfall happens northeast of Houston, the “worst” effects will be well displaced from the city. Even if the storm makes a second landfall south of Houston, the city isn’t going to experience anything close to Friday night’s Category-4 landfall. Over the gulf, winds could pick up, but they slow down when they reach land, because of the friction of things like trees and buildings. Yes. The primary issue at this point is rain. It’s just that in exiting back out over water, the storm reinvigorates a portion of its moisture flow. 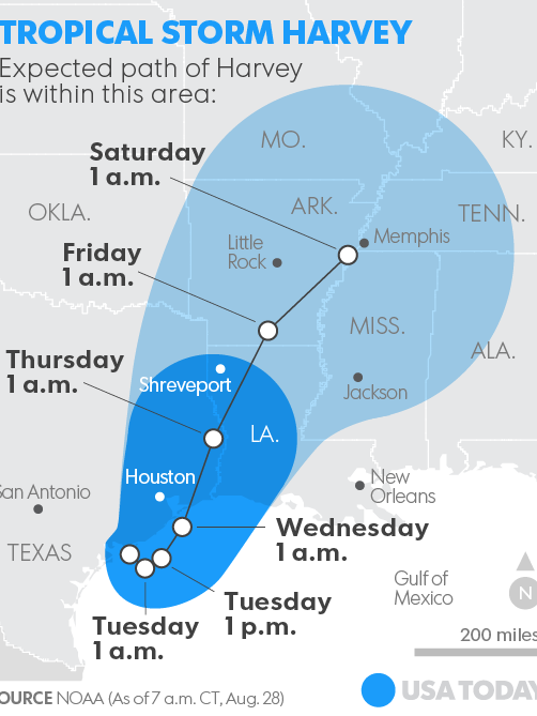 Today, the main thrust has moved into Louisiana and Eastern Texas. However, Houston is still getting some pretty heavy bands. More on this later. The SW Louisiana/SE Texas rice crop is devastated. Probably much of the corn, too. Thank you. That’s sort of good news. Duke Energy asked North Carolina’s Utilities Commission’s approval to cancel development of the Lee Nuclear Project.